keynote speeches and corporate training programs on artificial intelligence, deep learning, cybersecurity and financial trading. He has presented in Beijing, Chicago, Hong Kong, Kiev, Kuala Lumpur, Lima, London, Miami, Naples, New York, Santiago, Sao Paulo, Seoul, Shanghai, Singapore, Stockholm and Warsaw, among other global capitals. He contributes to The New York Times and China’s International Finance News and Sina Finance. Perez has presented to the Council on Foreign Relations, Vadym Hetman Kyiv National Economic University (Kiev), Quant Investment & HFT Summit APAC (Shanghai), U.S. Securities and Exchange Commission (Washington DC), CFA Singapore, Hong Kong Securities Institute, Courant Institute of Mathematical Sciences at New York University, University of International Business and Economics (Beijing), Hult International Business School (Shanghai) and Pace University (New York), among other public and private institutions. In addition, Perez has spoken at a number of global conferences, including Cyber Security World Conference (New York), Inside Market Data (Chicago), Emerging Markets Investments Summit (Warsaw), CME Group‘s Global Financial Leadership Conference (Naples Beach, FL), Harvard Business School‘s Venture Capital & Private Equity Conference (Boston), High-Frequency Trading Leaders Forum (New York, Chicago), MIT Sloan Investment Management Conference (Cambridge), Institutional Investor‘s Global Growth Markets Forum (London), Technical Analysis Society (Singapore), TradeTech Asia (Singapore), FIXGlobal Face2Face (Seoul) and Private Equity Convention Russia, CIS & Eurasia (London). 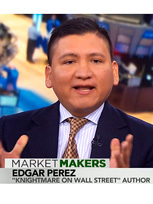 Perez was a vice president at Citigroup, a senior consultant at IBM, and a strategy consultant at McKinsey & Co. in New York City. Previously, he managed Operations and Technology for Peruval Finance. 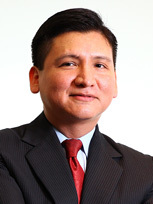 Perez has an undergraduate degree in Systems Engineering from Universidad Nacional de Ingeniería, Lima, Peru (1994), a Master of Administration from Universidad ESAN, Lima, Peru (1997) and a Master of Business Administration from Columbia Business School, New York, with a dual major in Finance and Management (2002). He belongs to the Beta Gamma Sigma honor society. Perez is an accomplished salsa and hustle dancer and resides in the New York City area with wife Olga, son Edgar Felipe and daughter Svetlana Sofia.